Three of my absolute favorite DIY products I use every day sit in my refrigerator… and I’m going to show them to you today. When I first started to become more aware of what I was putting in my body I started to change a few things. In all honesty I still had no idea where that road would lead. I started with Soy Milk substitues then learned about the hormone issues that can cause and switched to Almond. Next came the dangers of processed meat and I began buying the organic packaged meat in the chain grocery store I was shopping in. Then I learned there were hormones in the meat even though it was organic, so I started buying local, farm raised meat from a source I trusted. It’s amazing how the black hole of education swallows you up and the more you learn the more you feel like you have so much to learn! Lately I have started to take on making more of the products I use often in my kitchen instead of buying them off the shelf. 1. Peel the lemons leaving as much of the pith (White part between the peel and the pulp) as possible. I was pretty shocked how easy this one was! We use ACV in countless ways in our home… and every Sunday our family movie night dinner menu consists of air popped popcorn, cheese cubes and APPLES! I LOVE vinaigrette dressing! 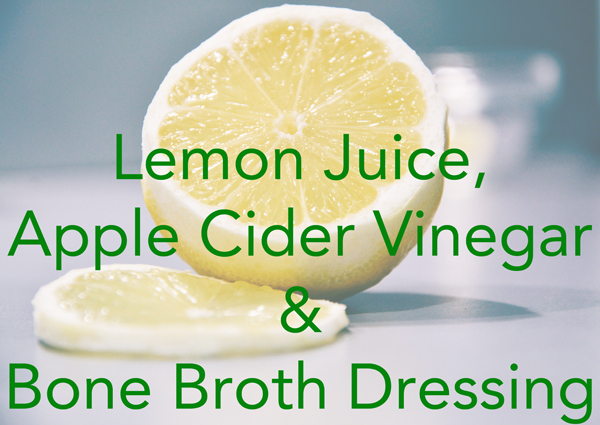 This is an awesome and creative way to add your bone broth into your diet. I like to play with this recipe, and to be honest it’s a little different every time… I’m not known for using my measuring spoons often. In other words… make this concoction your own!